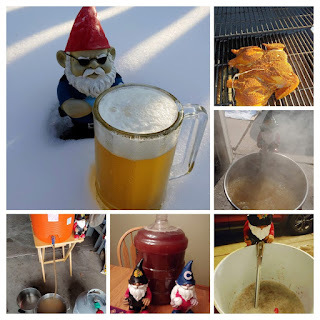 I brewed my 229th batch of beer Sunday. Last time I kegged a saison (2019 Arctic Vortex Winter Saison), I harvested the yeast from that batch. Generally, I brew 4 saisons a year Winter / Spring / Summer / and Autumn. I call these my Seasonal Saisons. 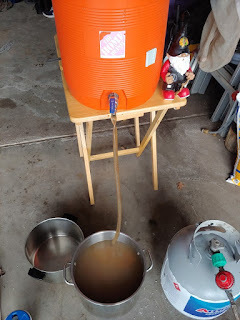 I didn't really want to keep the harvested yeast until time to brew the Spring Saison, Plus, I sort of want to experiment with my homebrewed saisons some. 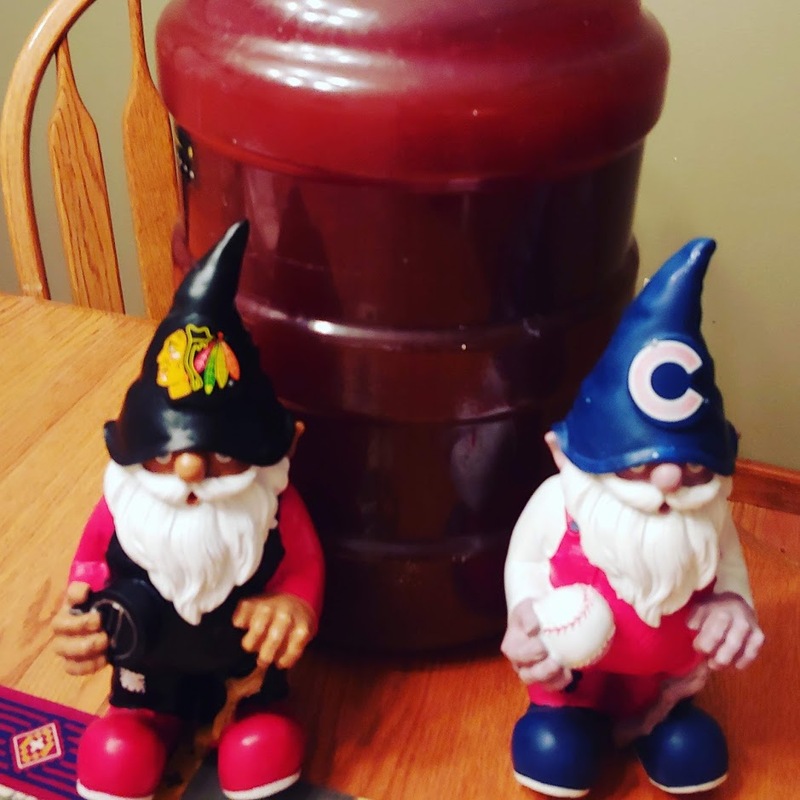 So, I decided that I would brew an off-cycle experimental saison. A "5th Season" as it were. Nothing too crazy on the experiment. I thought a Blood Orange Saison would be good. And that is what I made this Sunday. Before brewing, I had to empty my fermentor, since only the weekend before I had brewed Mardi Bock. Mardi Bock appears to be at or close to terminal gravity for the beer, but it really needs longer to clean up some. So, I racked it into a secondary fermentor. Then, I started brewing my 5th Season. I got started around 6AM. 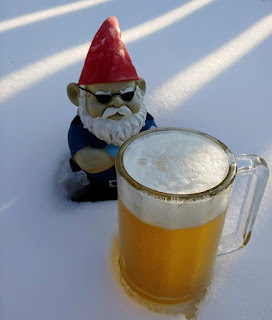 There is still snow on my back patio, so I decided to brew in the garage. The mash and sparge went fine. I ended up low on the volume and high on the pre-boil gravity so I diluted the wort with water. 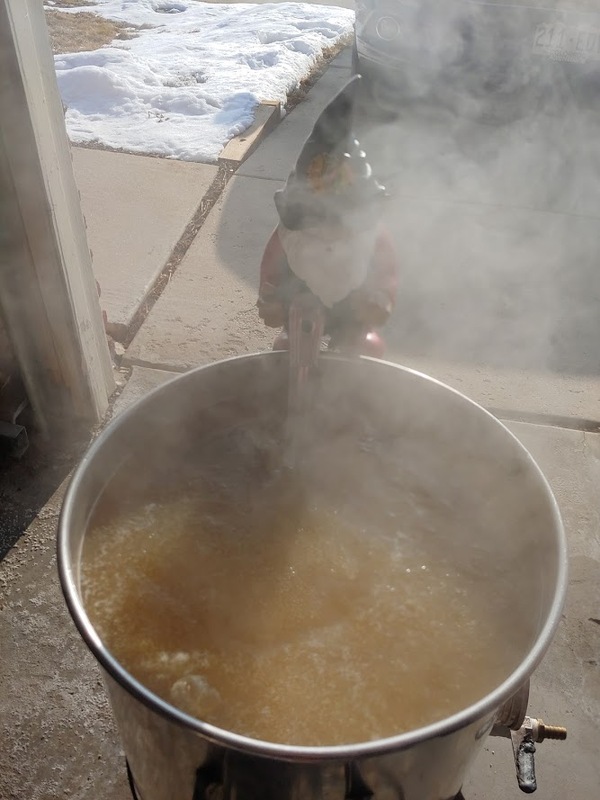 I started the boil around 8:30. There was nothing all that remarkable about the boil. Around 10AM, I stopped the boil and started chilling the wort. The OG was at 1.050. Planned was 1.055, but I'm not real sure if that was supposed to include the Blood Orange puree or not. So, I decided to go with the 1.050 gravity rather than adding more sugar. I didn't chill as long as usual. The temperature of the wort was around 68 degrees. I added puree and the yeast to the fermentor first and then racked on top of that. By noon I was all done cleaning up. 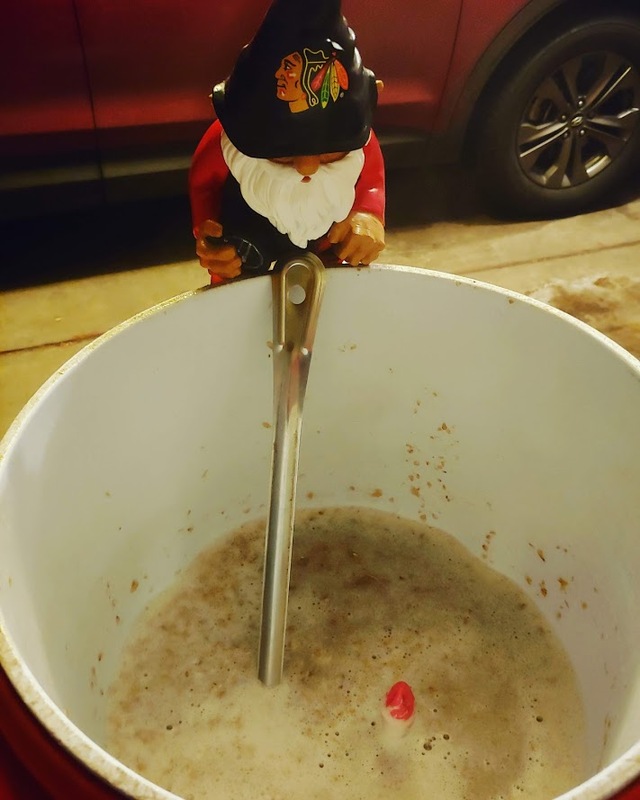 By Monday morning, the yeast was rocking and the gravity has already dropped significantly to 1.040. Later in the day, I smoked a chicken for the family dinner. 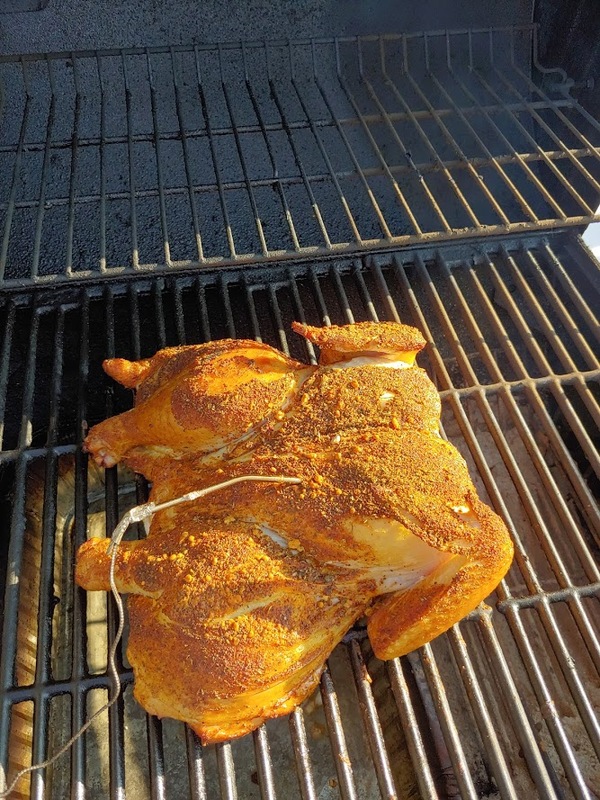 I spatchcocked this bird, and covered it with the homemade rub I have. I smoked the chicken with Apple Wood and charcoal. The temperature ran between 315 and 350 for about 2 and a half hours. For some reason, I was getting significantly different internal temperatures between my wireless probe and my instant-read thermometers. I suppose I didn't have the probe deep enough in the breast. Anyway ... eventually I pulled the chicken off when my instant read showed 165 everywhere. The chicken rested 20 or 30 minutes before I cut it up to serve to the family. This is the second time I've spatchcocked a whole chicken. I'm not sure it is giving me what people say it should. According to those who advocate using this method, it is supposed to cut the cooking time and make the bird more evenly done. Neither time seemed to go faster, and I never really had an issue with uneven cooking with my beer-can method. At the same time, it doesn't seem to take away anything from the bird. It is a little easier to apply the rub. It also sits on the grill grate flat so I don't have to remove the warming rack from the smoker. I guess those two things are positives. So, I think I'm going to try this spatchcock method some more to play around with it. As always, keep an eye on the regular SheppyBrew Channels to see what is happening with beer and other things: SheppyBrew's Facebook Page; Sheppy's Twitter Feed;SheppyBrew's Instagram Page; and SheppyBrew's Website. Of course, don't forget to visit this blog often as well!